It’s not long to go until we receive the brand-new milestone t-shirts from Tribesports. We know there is tremendous excitement and anticipation for these hard-earned t-shirts, so we hope the following update answers as many of your questions as possible. Where are the new milestone t-shirts? The Tribesports factory is finishing off the first run of 21,000 milestone t-shirts and preparing them to be boxed-up and shipped to the UK. They’re scheduled to arrive in Southampton on the 23rd of June. Subject to clearing customs, the t-shirts will then be sent to Wiggle’s warehouse ready for fulfillment. So when will I get my shirt? Since this is a very large consignment we will be carefully managing the fulfillment process. We expect to go live with the new system the week commencing Monday the 29th of June. When Tribesports stepped in to save the future of the parkrun milestone t-shirt in December, some people had unfortunately already been waiting for their t-shirt for several months. Our priority is that those who have been waiting longest will receive their shirts first. Therefore we will gradually allow access to the new system based on when a parkrunner qualified for their milestone t-shirt. For those working towards a milestone, your profile page will show how many events you’ve completed and how many more you need to complete before you reach the next milestone. If you are a parkrunner due a milestone t-shirt (or more than one if you have qualified for a combination of 10 (juniors only), 50, 100, 250, 500 or volunteer t-shirts), you will get a message in your profile (accessible through the link in your weekly newsletter email or results email) informing you that you are now entitled to claim your milestone t-shirt. A personalised link will then take you to the appropriate product page on our Wiggle-powered online store where you'll be able to order your t-shirt(s). The shirt itself will appear as free, but you will be required to pay postage unless additional items are added to your basket where you may then qualify for free postage. Standard tracked delivery is £1.99 in the UK and free if you spend over £10. For those outside the UK, check the Wiggle website for the equivalent in your country and currency. Once the order has been placed, your profile page will be updated to show that the t-shirt(s) have been claimed. All milestone t-shirts are a ‘regular fit’, and not a tight performance fit. On the milestone t-shirt product page a sizing chart will help assist those unsure of what size to order. What if I already ordered my milestone t-shirt under the old system – will it still be delivered to my home event? No. We’ve made the decision to process all milestone t-shirts in the same way. In other words everyone will need to order through the Wiggle store, even if you have previously confirmed your milestone t-shirt size and were expecting it to be delivered to your home event. With so many parkrunners waiting for shirts to be delivered, we felt that the potential impact on individual event teams receiving and distributing hundreds of shirts was too great. 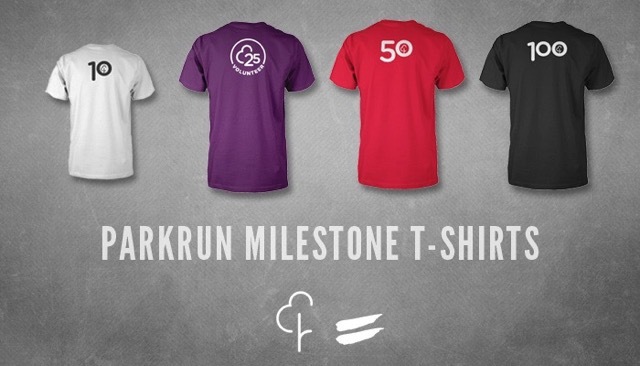 We also know that due to the significant time-frame the milestone shirts are backdated over that many parkrunners will have moved events or changed size. Placing the order through the Wiggle store allows for individuals to double-check their desired t-shirt size (against the size chart that will be provided) and to update their address details if necessary. Ordering this way also ensures parkrunners can take advantage of Wiggle’s fantastic free returns policy if needed. This does mean that everyone will be required to pay for the postage of their milestone t-shirt. Given the sheer number of parkrunners who qualified for a milestone t-shirt under the old system, we are simply not in a position to provide free postage on top of the free t-shirt. We’re busy working behind the scenes to test the ordering process and to ensure that the fulfilment of your free milestone t-shirts is as seamless as possible. There’s nothing for you to do until your profile page indicates that you are eligible to order your t-shirt. If by Monday the 13th of July you haven’t been notified on your profile page that you are able to claim a milestone t-shirt (but you believe you have qualified), please get in touch with us via this link. In the meantime you can check out the design of the milestone t-shirts (including the sparkly new volunteer t-shirt!) by heading over to the Tribesports blog here.